Florida might not be the first place that comes to mind when someone says Christmas trees, but that doesn’t mean you can’t find a quality tree for your living room here. In fact, there are several good old fashioned Christmas tree farms throughout the Sunshine State that make picking out the perfect tree a fun tradition for the whole family. Best of all, the folks at these 10 best Christmas tree farms in Florida do all the hard work for you, so you can leave your ax at home. More like a holiday destination than your average Christmas tree farm, a trip to Santa’s Christmas Tree Forest is enough to put even the grinchiest Grinch in the holiday spirit. Families can cut their own tree, then sit down for a bite at the Hungry Elf Cafe, or soar like Santa’s sleigh on the 400-foot zip line. Make sure you visit the animals in the barnyard before you head home—they like the attention! 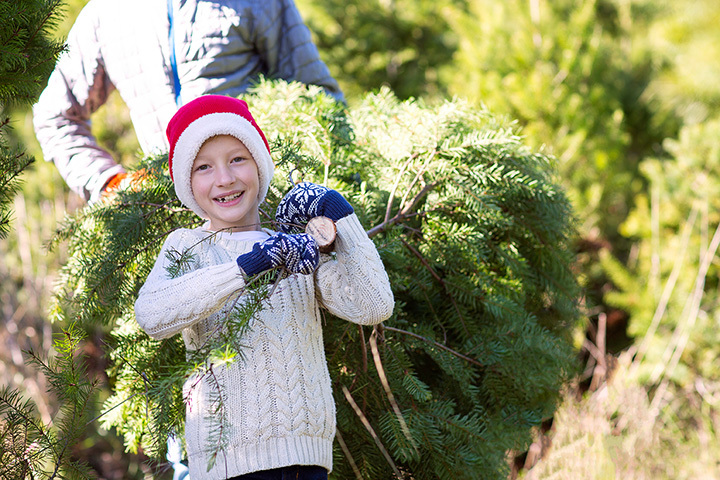 Transform your hunt for the perfect tree into a total Christmas experience at Ergle’s. Though they offer family fn on the farm year-round, Christmas is definitely one of the best times to visit. They provide everything you need to cut your own tree, including the labor! Guests can enjoy a train ride, concessions, and a visit with the barnyard animals. You can also take home a fresh cut wreath, Christmas cactus, or specialty items from the gift shop. Christmas trees come in all shapes and sizes, and the Merry Little Christmas Tree Farm has them all. These pines are as fresh as they come. All they need is for you to cut it down and take it home. Experience real old fashion charm at this tree farm, it will certainly put stars in your eyes! Whether you prefer to “choose and cut,” buy a potted tree, or grab a pre-cut fresh fir, Gibbs Christmas Tree Farm offers the experience you’re looking for. Kids and adults alike will love the hayride and barn animals, in addition to finding a tree worthy of your home. Make sure you grab their coupon from their Facebook page before you go! This working tree farm gives guests a chance to venture into the field to find and cut their ideal Christmas tree. You do the cutting, they provide the netting! They also feature additional activities, like hayrides, train rides, and bonfires every night. You’ll want to spend the whole afternoon here. 🎄 let the fa la la festivities begin! Family is what Christmas is all about, and there’s no better reflection of this than at Watson’s Christmas Tree Farm. This family owned and operated farm has been serving up heaping helpings of holiday spirit for nearly 30 years, along with wreaths and fun crafts that make perfect gift ideas. They offer choose and cut trees, along with imported trees to give you that Christmas vibe you’re looking for. Offering four varieties of Christmas trees, Songer’s is one of the best places to choose and cut your own. Their saws easily cut through every type of tree they offer, plus they’ll give your tree a good shakedown before you load it into your car. They also offer potted trees in case you want to keep the Christmas spirit alive long after Santa makes his debut. If you’re looking for a healthy tree at a good price, you need to check out what Neilson’s has grown. They offer u-cut sand pines in addition to a variety of imported northern trees that don’t grow well in Florida. They also offer potted Carolina Sapphires that make for beautiful home accents year-round. Although this one is technically a Christmas tree lot, not a farm, you can still get the same high quality tree that comes from an authentic u-cut farm. As a bonus, you can add bright "flocking" in any color to any tree. They also offer rich poinsettias, fresh garland, and handmade wreaths to complement your new holiday decor. This charming little Christmas tree farm offers the U-cut experience that is sure to become a family tradition. And with a name like Rudolph’s, you know the holiday spirit here is a 10.